Looking for Home Design Makeover Cheats? If you are then this post contains crucial information that you should know. There are dozens of websites all over the internet that offer cheats for this game, but do any of them really work? In order to find this out, we’ve decided to test them all out and share the results with you. Today we’re going to find out if getting free gems in Home Design Makeover is really as simple as entering your username on some “hack”. 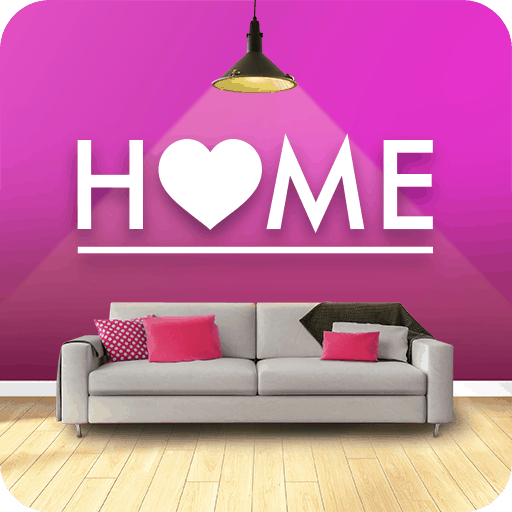 Home Design Makeover is a free to play game for Android and iOS. The game is quite similar to Design Home. It was released in 2018 by Storm 8 Studios. It quickly became on of the most popular Home Design games. The game is a lot of fun to play if you’re into the designing genre. However, there’s one big drawback in the game; the need for gems. Gems in Home Design Makeover can be quite hard to come by unless you buy them through in-app purchases, but they are not cheap. For that reason many players have been looking for ways to obtain free gems. Usually when you try to get free gems you find websites that claim they have cheats, hacks or generators. These sites claim that you can obtain an unlimited amount of free gems with the click of a button. But how do you know which ones of these hacks really work and which ones are fake? Normally you’d have to test them out yourself, but no longer. We’ve done all the hard work for you and will share the results of our testing with you today. 1 Do any hacks or cheats for Home Design Makeover actually work? Do any hacks or cheats for Home Design Makeover actually work? Finding websites that offer Home Design Makeover Hacks isn’t hard. A quick search on Google or YouTube will show you many websites that offer generators. Quite often these hacks look pretty legitimate, especially when you see YouTube videos where they actually show the gems being added to the account. 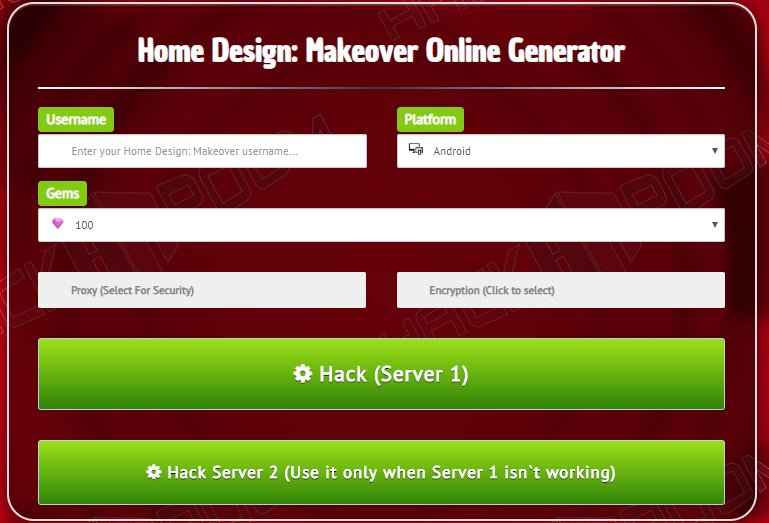 A screenshot of your average Home Design: Makeover generator. Looks good, but does it actually work? Now of course, they don’t all look exactly the same. Maybe one of the hacks for Home Design Makeover that you have tried looked a bit different. However, while there are minor differences in appearance they all function in exactly the same way. They ask for your username, the platform you play on and the amount of gems you want to generate. While these hacks look pretty legitimate, upon testing them we discovered that none of them worked! Every single one of these Home Design Makeover generators claims that you will receive thousands of gems within seconds, but in reality we didn’t receive a single gem from any of them. They’re all completely fake. Obtaining free gems through these generators is completely impossible. No matter how hard these sites try to convince you that their hack works, do not fall for it. You’ll just end up wasting your time. In addition to hack tools, there are also sites that offer cheat codes. These might seem like a good alternative since hacks do not work and these cheat codes at first glance seem like they’d work. However, these sites that offer cheat codes for Home Design Makeover don’t tell you how to enter these cheat codes. There’s a very simple reason why they don’t tell you this; because you can’t enter them anywhere. These cheat codes are nothing more than a string of random numbers and letters. They’re not real cheat codes and you can’t use them for anything because you can’t enter them anywhere. However, obtaining free gems is possible! Keep reading and we’ll tell you how. While it’s unfortunate that you can’t enter your username on some generator and watch the gems fly in it’s not impossible to obtain gems for free. We’ve discovered a very powerful method of obtaining gems for free. The method we discovered does not consist of some basic gameplay tips that other sites try to play off as a “cheat”. It’s a completely legitimate method that’s guaranteed to work. This method is powerful, fast and the only working way to get free gems out there. We’ve created a handy guide that’ll teach you our method in detail. You can simply access our guide, follow the steps and get the gems you need. Of course, using this method will take a bit more effort than pressing a button on some generator, but at least it really works. The guide works on both the Android and iPhone version of Home Design Makeover and does not require jailbreak or root. And best of all, the guide is available completely for free. Click the button below to access our guide and learn our method of obtaining tons of gems without spending a dime!